Coronary artery bypass graft: Abbreviated CABG. A form of bypass surgery that can create new routes around narrowed and blocked coronary arteries, permitting increased blood flow to deliver oxygen and nutrients to the heart muscle. Coronary artery bypass graft is an option for selected groups of patients with significant narrowings and blockages of the heart arteries. The bypass graft for a CABG can be a vein from the leg or an inner chest-wall artery. CABG surgery is one of the most commonly performed major operations. 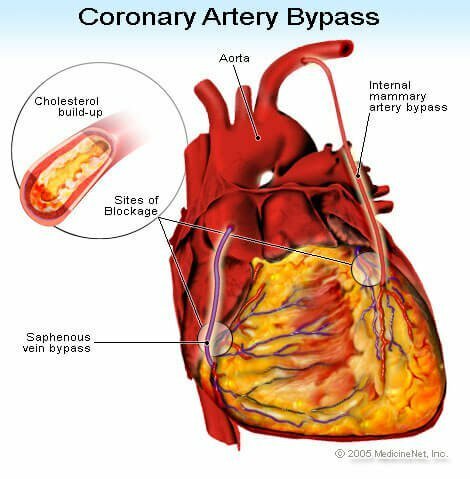 Coronary artery disease develops because of hardening of the arteries (atherosclerosis) that supply blood to the heart muscle. Diagnostic tests prior to (and after) CABG include the electrocardiogram (EKG), stress test, echocardiogram, and coronary angiography.